Uniquely, over the past thirty years we have staged 6 community plays, and in 2020 we will be staging Spinning the Moon by Stephanie Dale. This is Stephanie’s second time under commission with us – she co-wrote A Time to Keep with David Edgar in 2007. We have created a website to chart the progress towards Spinning the Moon: www.spinningthemoon.org.uk have a look and see where we are. Spinning the Moon will be performed in 2020, however there is much to be done in engaging with the wider community, raising funds and holding events and continuing to build excitement as the production phase approaches. Workshops and casting will take place towards the end of 2019. Please do get in touch via the CONTACT page on this website or via the Spinning the Moon website if you have any skills and talents you can offer - we'd love you to get involved! Spinning the Moon is a compelling new community play based on documents provided by the DCPA Research Group. Set in the early 16th century, the play, like Shakespeare’s history plays, has taken a sense of what was happening in Dorset over a fifty-year period and has conflated those happenings to create a work of dramatic fiction. Central to the action are the Trenchard family, who lived at Wolfeton House on the outskirts of Dorchester. The Trenchards are desperately trying to stop their home, and the people who work their land, from spinning towards economic collapse and ruining the lives of all who depend on the estate for their livelihoods. But the advice they take from a monk leaves their community fractured to the point of violent disintegration. Characters in the play include: the Trenchard family, farmers, shepherds and their families, the Queen of Spain and her entourage and the cunning women who live in the hills. Our first national community theatre conference in collaboration with Dorchester Arts took place on Saturday 15th September. The conference was held in memory of founder, Honorary Life President and revered pioneer of Community Theatre, Ann Jellicoe who died in August last year. Around fifty delegates attended and were informed and enthused by a knowledgeable and inspiring panel of speakers including Andy Barrett, Peter Cann, Stephanie Dale, David Edgar, Steph Green, Jon Oram and Sarah Weston. Each speaker took to the floor and spoke enthusiastically about their particular experience and view of community theatre, this was discussed further by each panel and then opened to questions from the floor. 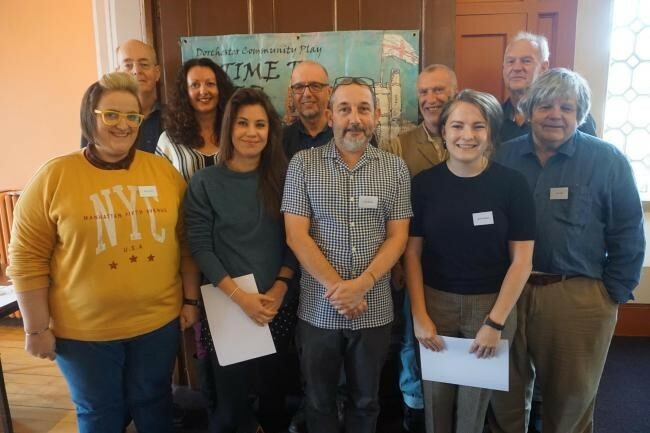 "I really appreciated the opportunity to find out more about the life and work of Ann Jellicoe and to meet so many people who had been involved in some way in the Dorchester Community Plays over the years. David Edgar’s talk was extremely thought provoking. I have been reflecting on my participation in the recent National Theatre community performance of Pericles and its legacy. I’ve been thinking about the difference between community and participatory theatre and where the boundaries lie between the two. The Director, Emily Lim said, “Public Acts (the NT's new initiative to create extraordinary acts of theatre and community) is founded on the belief that theatre can be a force for change, bringing communities together to experience the power of collective purpose and imagination.” I believe Pericles certainly achieved that aim." We know through the process of six previous community plays that this is certainly the case. Ann Jellicoe was the first woman to have a play on the main stage at the Royal Court Theatre and as a result of a desire to live in the countryside, she unwittingly created a new, dynamic form of theatre in her daughter’s school. Ann’s form of community theatre involves hundreds of local people coming together to put on a play about its past. The community work with a team of professionals, such as a set designer, director and stage manager, who ensure that the work is of the highest standard. After 35 years there are generations of women – such as the Ansell family whose grandmother, mother and granddaughters - have acted in the plays together. Spinning the Moon is set in Dorchester in 1485. Echoing our current political and social climate, the play is based on conflated, real events which took place, in Dorchester, across a 50-year period. It explores the collapse of the manor houses and the rise in popularity to sheep farming, which in turn saw many people turned off the land and made homeless. It was a period of political and financial insecurity, which saw many people turning to desperate measures in a bid to survive. Witchcraft was also on the increase, as was punishment for being involved in such activities, as more and more people needed someone to blame for the breakdown of their society.